Garlic. Nearly ready for harvest. Categories: Scenes from the Field | Tags: Bee Highway, Dahlias, Farm Dog, Flowers, Garlic, Pollinators, Sunfloswers, Tomatillo, Tomatoes | Permalink. Categories: What's in your basket? 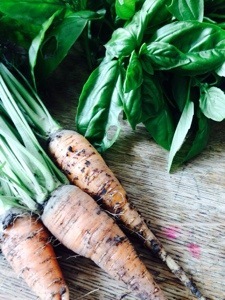 | Tags: basil, carrots | Permalink. Categories: Scenes from the Field | Tags: Basil plants, Bean Bettle damage, Christmas Lima Bean, CSA share, French Breakfast Radish, Garlic scapes, Growing vegetables, Heat Tolerant Lettuce, Peas, Pruning Basil, Scenes from the field, Sunflower | Permalink. If you’ve ever grown tomatoes you know where this is going. You know that smell they leave on your fingers when you’re pruning and training them. It’s nothing I can describe in words. All I know is I’m happy to be smelling it again. 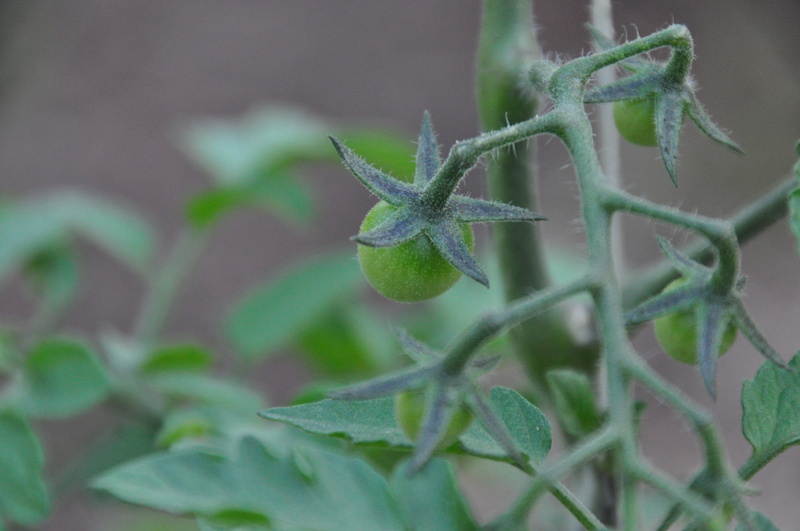 This year’s tomato plants are extra special since we grew them from seed. The fact that some are now standing over two feet tall in the ground is nothing less than amazing. And they are just starting to show their first signs of fruiting. We’re mostly growing cherry tomatoes this year (see “What We’re Growing 2014” for a full list) to try to avoid some of the worst plagues of any backyard tomato grower – early blight, blossom end rot, splitting and cracking… These are all indeterminate varieties, which means they will, in theory, continue to grow and set fruit until they die from frost, so we’re training them up a line of twine. This video explains the process pretty clearly. Hoping our CSA members will take a look to learn how to help care for the plants here as well as those they took home. Of course, if you have the space, you can just let them run wild. We’re going with this option to keep the plants from becoming a mess of vines. This should ensure good air circulation and an easier harvest. Now get out there and get yourself some sweet smelling tomato fingers. 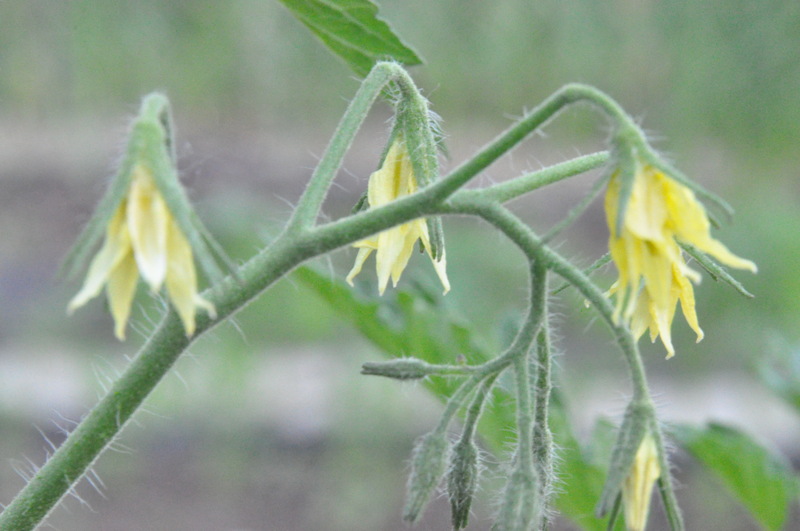 Categories: Uncategorized | Tags: Backyard tomatoes, Growing tomatoes in Ohio, Pruning and Training tomatoes, Tomato flowers, tomato fruits, Tomato smell | Permalink.